Jupiter and Venus, two of the brightest planets in our solar system, will be coming close together for some time before dawn on Monday, November 13. Both of the planets will be visible to the naked eye only during the civil twilight before dawn as Jupiter will not be visible once the sun comes up. A conjunction between two or more planets or star clusters happens when they share the same right ascension in the sky and thus look near each other when they are actually not. This phenomena is not very rare as it appears ever 13th month; however it owns a special place in the astrological world. The conjunction of these two planets can be seen towards the south east with telescopes as well as naked eye in the sky dome in the eastern horizon. 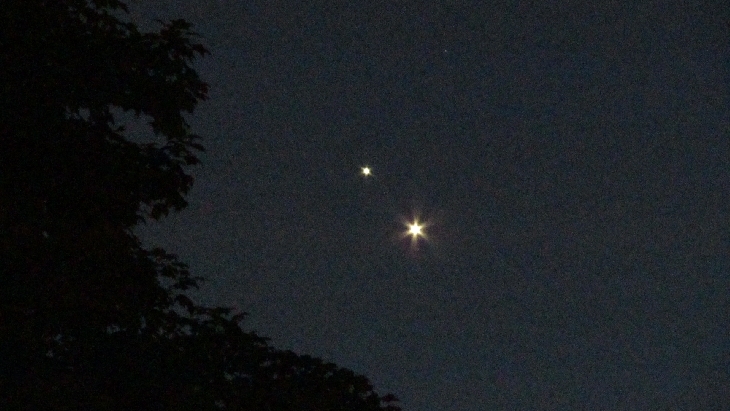 At their closest, Venus and Jupiter will be 0.3o apart which is less than the apparent diameter of the moon (0.5o). Venus is known as the brightest planet and it always follows up as the second one and will be “snuggling “with Jupiter. It will be a spectacular event as the two bright objects are seen floating close to each other. Some also call it “the kiss “between the two planets. The conjunction was spotted on 27th august 2016 and in July on 2015. The next one is expected on 22 January 2019. Venus will be 152 million miles (246 million kilometers) from us, while Jupiter is nearly four times farther away, at 594 million miles (956 million km). A conjunction between Jupiter and Mars is also expected after a few weeks when Venus and Jupiter drift apart from each other. Though telescope users are strictly warned to be careful with the binoculars and telescope as the sun will be rising from the same side and if caught in telescope it can cause serious damage to the eyes because of no proper use of a sun filter.